Sometimes too much choice can be a good thing. Over the past decades, architects, developers, builders and home renovators have seen an incredible boost in options for selecting timber windows and doors. Timber is a great choice for custom window and door frames because it’s strong, energy-efficient and adaptable. It’s a beautiful solution whether you’re retrofitting it to a heritage property or creating your signature style with a contemporary home. But myths about timber frames pervade. Timber’s been framed – if you pardon the pun. We tackle the myths here. One myth is that wood rots and does so fast, therefore UPVC frames will last the distance. Actually, sun exposure discolours plastic meaning it can become brittle beyond repair. Meanwhile, upkeep for wooden-framed windows is simply repainting, such as every five years or so, which makes them as good as new generally. Our window and door frames are prime coated before they leave our factory. Once installed, they need at least another two coats soon after and are then guaranteed to last for 10 years. (Remember to give them a lick of paint a couple of times again well before they hit that mark). But we expect timber to last much longer than that. On average, timber-framed windows last over 40 years, while plastic has a service life of just 25 years, according to the Green Building Forum. Consider, too, that as a custom window and door frame manufacturer, Acacia Joinery hand-selects high quality hardwoods. They need to tick the box for durability rating, which means they are unlikely to rot in our lifetime. Considering the little upkeep that timber-frames need, overall it’s got to save in the long term because you won’t need to replace it as often as plastic. But plastic’s actually harder to repair. It might hit your hip pocket to not install timber. In fact, a UK study by estate agents English Heritage found “unsympathetic replacement of … windows – particularly with plastic and UPVC – to be the single biggest threat to property values in conservation areas”. They say such a move could devalue such a home by up to $AUD36,000. It’s all about energy efficiency and the comfort levels of a building’s residents and users these days. You’d know timber doesn’t conduct heat or cold – it is a very low thermal conductor. It’s a natural insulator. The innate thermal properties of timber add to the comfort levels and, importantly, timber meets mandatory energy efficiency regulations without a hassle. It’s carbon neutral and recyclable. 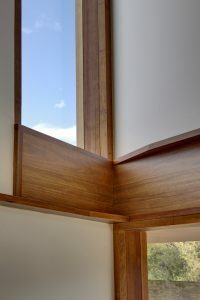 Acacia Joinery, a custom timber window and door manufacturer in Wollongong NSW, sources wood from Chain of Custody forests, too, so they’ve been verified against global standards. Some might say, though, it’s not so much the frame, but what you put in it. In the past, single-pane glazed clear glass was the norm for windows and glass doors in Australian building projects. Now the window’s wide open, to speak, with double and triple glazing, low E glasses, noise-attenuating glass, high-security windows and more. Talk about performance. Sure, UPVC has become a standard for double-glazed windows. However, you certainly can have single, double or triple-glazed windows or doors with timber frames. End of story. Fair call depending on where and how you’re getting your bespoke windows or doors manufactured. You’d want a manufacturer to ensure the windows and their hardware are tested for mechanical strength. As well, skilled manufacturers such as Acacia can create an amazing range of frame profiles and shapes to help realise your design so it definitely ticks the box for safety and security. So, it makes sense to go to an expert in timber windows for advice while you’re in the planning stages. Discuss your options for your project. You’d want a partner for that process who understands your vision and design. Acacia can guide you through the process in custom manufacturing a timber-framed window or door for you better, faster … together. Your architectural plans are the starting point for the conversation. So, being spoilt for choice is actually a good thing when it comes to custom timber windows. It’s all about making your designs see the light of day and tick the boxes for quality, style, comfort and security.